A frequent topic of investigations from the @DFRLab is the danger of damage to critical infrastructure in the Donbas due to the ongoing conflict, raising the possibility of environmental disaster. This week, we spoke with Wim Zwijnenburg, the Humanitarian Disarmament Project Leader for PAX, a Dutch NGO that works to end and reduce the effects of war. Zwijnenburg recently visited the front lines of the Donbas to collect information on the risks of environmental pollution in government-controlled areas along the front lines of the war in eastern Ukraine. Zwijnenburg has conducted both field work and digital research into detrimental effects against the environment and nearby civilians from conflict since 2013. In particular, Zwijnenburg has published numerous articles on Bellingcat on environmental issues related to conflict, including the destruction of oil assets in Iraq and Syria and the dangers of ongoing fighting near water treatment plants in eastern Ukraine. In speaking with Zwijnenburg, we gained a number of insights into the current situation in the conflict area in eastern Ukraine, how civilians are coping with ongoing conditions, and how a number of environmental problems, while lingering for decades, have been exacerbated by war. In December 2017, the OSCE published an environmental assessment on the situation in Eastern Ukraine and documented potential pollution concerns and other environmental impacts caused by the ongoing hostilities. In a similar report from December 2017, the UN Commission for Human Rights warned of severe ecological disaster in the Donbas and its impact on human rights in the area. Other organizations, such as ZoI and the Toxic Remnants of War Project, have also documented the ecological impact of conflict through research and advocacy work and by raising the issue in the UN Environmental Assembly discussions, where, in 2016, Ukraine submitted a resolution regarding the protection of the environment in armed conflicts. This resolution was followed in 2017 by a resolution on conflict pollution, tabled by Iraq and supported the Ukraine. DFRLab: Can you tell us why you decided to visit the Donbas? Zwijnenburg: As the fighting in the Donbas is entering its fifth year, the wider impact of hostilities has gained more traction from various media outlets. I traveled to the area with a Dutch journalist who lived in Ukraine and Poland, had reported on the conflict in the Donbas, and had a long-standing interest in the environmental consequences and related health impacts of the conflict. This theme receives hardly any media attention, apart from the occasional warning by national authorities, the UN Special Rapporteurs, or the OSCE. One major challenge for bringing this to the attention of the wider public is that people often associate the environment with soft security issues, and as long as people aren’t directly affected, attention to the issue wanes. So, this journalist saw the need to travel there and hear the personal stories from civilians who are living on the front line, facing the daily threats of an ecological catastrophe that would happen if an artillery round hits a chemical factory, while already enduring the danger of the daily shelling. As the environment in wartime is a topic is difficult to cover, as it’s often viewed as ‘soft security’ topic, we aimed to put forward the stories from civilians who will be affected if there are cases of severe pollution caused by the hostilities. So we decided to go there together and report on this issue. DFRLab: With eastern Ukraine being such a large space with a number of sensitive locations, where did you decide to visit? Zwijnenburg: Based on the open source data collection, as published on Bellingcat, we selected a number accessible locations in government-controlled areas where the conflict could lead to environmental pollution. Getting access to non-government controlled areas proved to be difficult, hence the focus on this side of the conflict zone. Before taking the train to Kramatorsk, I met with the OSCE in Kyiv to hear their expert assessment, as they just finished drafting their latest Environmental Assessment and Recovery Priorities report. 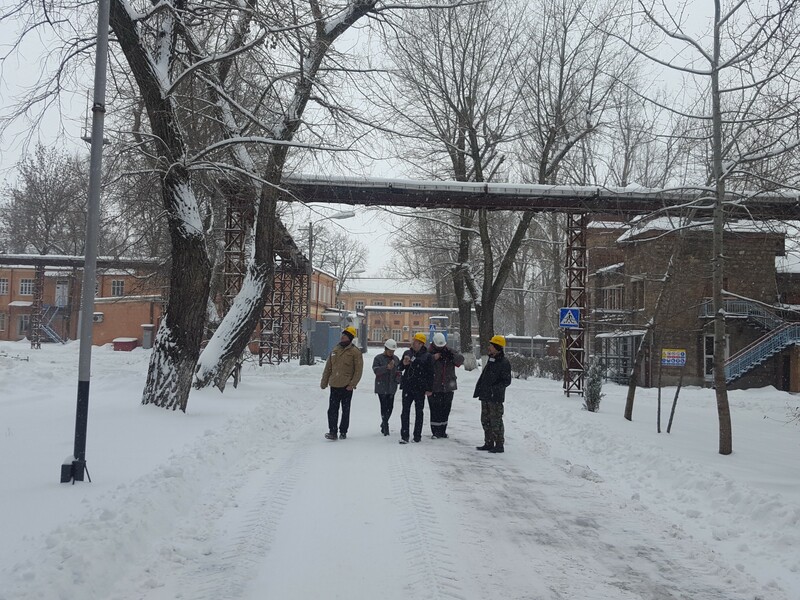 Based on the available information, we aimed to visit a phenol factory, some coal mines, the Bakhmut Agrarian Union and the Avdiivka Coke and Chemical Plant. Unfortunately, due to heavy snowfall, we did not make it to Avdiivka. We met with coal mine workers, managing directors of factories, local politicians, public health officials, military commanders, and local villagers to discuss the situation. 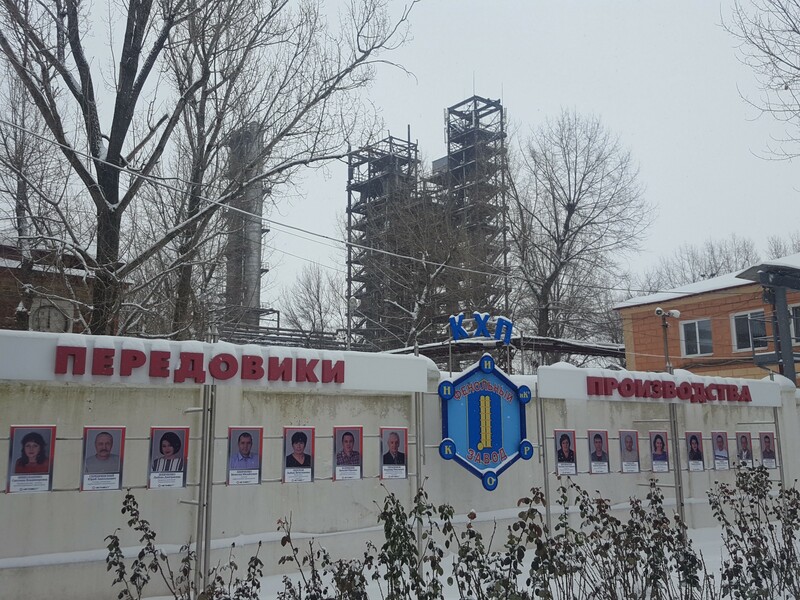 DFRLab: Tell us about the situation at the phenol factory in Novhorodske. Zwijnenburg: The toxic waste from the phenol factory is stored in a couple of waste ponds right next to military positions, which, if those are targeted, could result in the breaching of the pond waste walls. This would lead to hundreds of thousands of cubic liters of toxic waste affecting groundwater and the nearby Kryyvi and Siverskyi Donets rivers, which are the main water sources for the whole Donbas region. Not only that, if the factory is hit, it would also cause a major chemical incident. We met the local director and received a warm welcome, and they were eager to talk about the situation. We were given a tour of the factory, which produces large quantities of naphthalene and phenol, the latter being a very volatile, toxic acidic organic compound. Its main use is in the pharmaceutical industry, and for plastics. 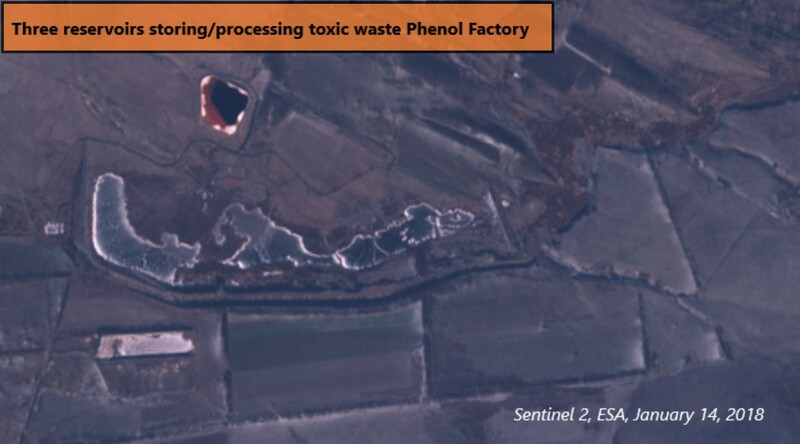 Phenol is extracted through a chemical process from coal tar, and imported from the Avdiivka Coke and Chemical Plant. At the moment, there hasn’t been any high risk of shelling at the factory, though that is perhaps only a matter of perception. 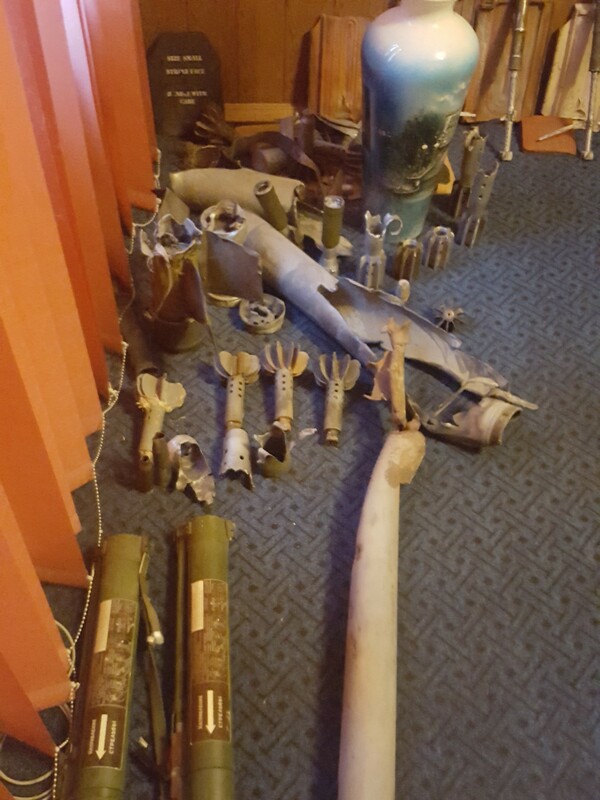 The director stated there was no risk of shelling, and that the last mortar round fell 20 meters away from the factory, which to us seems pretty close. When we talked with villagers about the factory, they were all happy with the jobs provided, though all said people were dying fast due to cancer and other health problems, which they attribute to being exposed to chemicals while on the job. They also were concerned the factory would be hit by shelling, and stated no one informed them what to do this in case a chemical incident would happen. There were only two gas masks present at the local shelter. As for the toxic waste pond, an agreement has been reached by the Joint Center for Control and Coordination (a communication channel between the Ukrainian and the Russian military) in November 2017 to provide security guaranties for ‘window of silence’, so repair work at the pond could start. The pond needs bi-weekly maintenance and checks to ensure there is no leakage that could result in a spill. 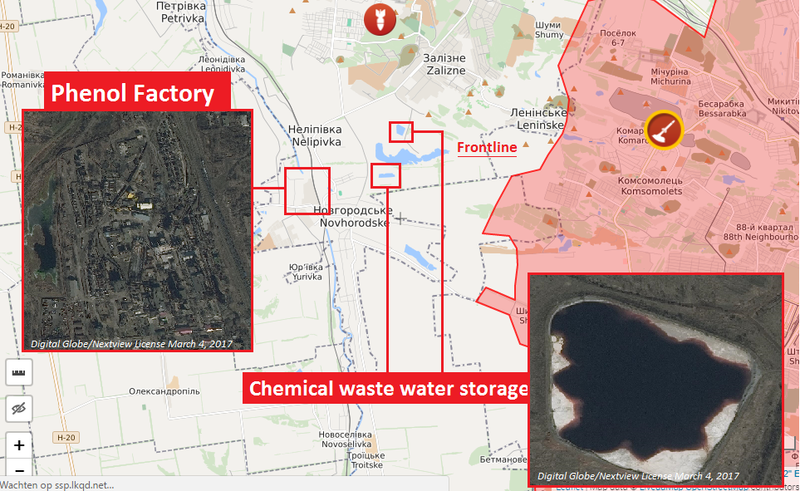 However, looking at satellite images, it’s clear that the Ukrainian army set up positions next to the waste pond. When we asked the local military commander about this choice, he explained that if they didn’t control that area, the Russian-backed separatists would take control over it, making it difficult for them target these positions. So both sides are aware of the strategic advantage of taking position at these locations. Zwijnenburg: What struck us while travelling through the region was the complexity of the issue, as the Donbas had a history of pollution prior to the conflict that was compounded by years of weak environmental regulation. Local villagers complained about the health risks of living and working in the industry, though they also endured it, as there was little else in terms of work opportunities, and the jobs pay well. There was a sense of fatalism and acceptance of all the health risks caused by the industry and the ongoing threats of armed violence. Seeing the situation from the ground also made us realize the risks of something going wrong, as many of the environmentally-sensitive locations are near the front line, or even directly on the front line. Civilians have been going through the eye of a needle, as no events have happened in the last few years that resulted in a chemical catastrophe. Though it is starting to feel more like not a question of if this will happen, but instead when it will happen. This becomes more clear when you’re actually on the ground. 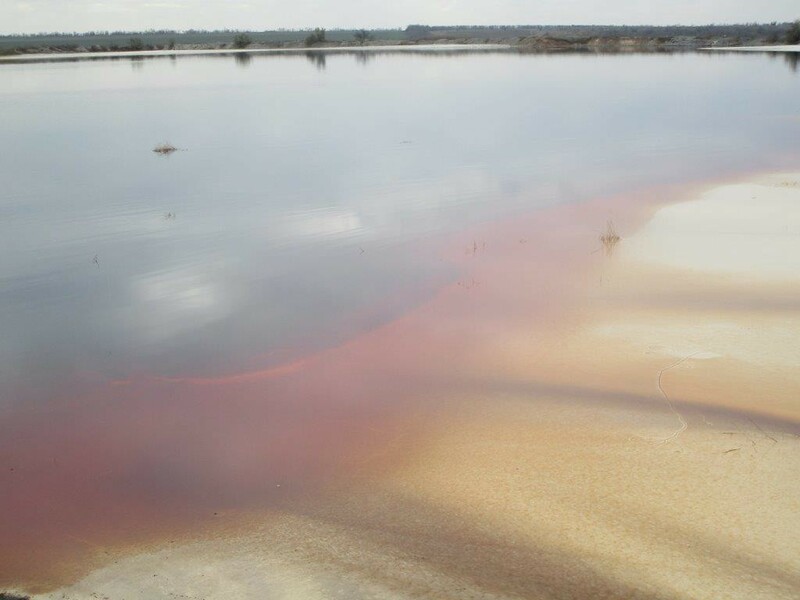 For example, when visiting Novoluhanske, where a pig farm is located with a waste pond storing one million cubic meters of waste-containing ammonia, nitrates and antibiotics, generated by the 90,000 pigs. In the near distance, around three or four kilometers away, we heard a barrage of heavy artillery shells falling on Ukrainian positions at Svitlodarsk. Locals were used to it and continued their shopping in the small village. When we visited the pig farm to talk about the potential risk, there was still a big hole visible in the office building where a Grad missile hit the building in December 2017. Though their biggest concern at the moment was to prevent contamination of their livestock with the African plague, a virus that has been going around in the region. before, when you were working with data/materials from afar? Zwijnenburg: There was this strange feeling that the situation was becoming a sort of stand-off. Both parties are well aware of the risks involved if they hit a chemical factory or other environmentally-sensitive site, as the spill and pollution would affect both government and non-government controlled areas. Yet, both parties also set up military positions next to these sites, knowing that their opponent will think twice before firing, thus taking advantage of these risks. But again, only one mistake can have major consequences. Despite these risks, there is still the occasional shelling near these sites. When we arrived at Novhorodske, where the phenol factory is located, mine clearance crews just finished removing UXOs [unexploded ordnance] from near the toxic waste pond. The threat still looms. Better information sharing, and more awareness of these risks communicated to both parties could foster better understanding of the devastating potential impact. So, we’re hopeful that our work and the great work by many others, including the ICRC, UNICEF, the OSCE, UN Special Rapporteurs, and civil society groups like ZoI doing research on the environmental impact, can raise the profile of this issue and thus prevent an accident from happening. DFRLab: What are some of the concerns voiced to you from government, OSCE, and NGO officials on the ground? How do they compare with the issues that are most discussed in the press and by policy makers? Zwijnenburg: Local public health officials were in dire need of better equipment for their monitoring and sampling work. They were still working with outdated equipment to do fast and efficient sampling, for example to check for heavy metals in soil and water. While the Ministry of Environment on a national level has a functioning system to monitor water pollution and conduct sampling, there is still a shortage of sufficient tools and expertise on a local level do this structurally. There also seems to be an absence of information sharing. We visited a brigade in Novhorodske that just moved in, but their commander had no idea there was a toxic waste pond, storing 350,000 liters of chemicals, literally next to the frontline trenches where his troops were located. In his defense, he just got in the previous day, but this is the kind of information he should have known beforehand. Local citizens have a range of issues they are struggling with, the obvious one being the shelling and occasional small-arms fire exchanges, but also food and gas prices and access to medical care. As the local mayor explained, the prices for electricity also went up dramatically, and electricity is needed to keep pumping out the groundwater from closed or functioning coal mines. If these mines are flooded, they can also bring out toxic or radioactive waste stored there, seriously affecting the regional environment and public health. The national government is responsible for this and paying the bills, but it’s getting more costly to do this. A reoccurring theme in the conversations is that the problem with the environment was that once it would go wrong, it would go wrong in a very destructive way. Until then, people hope and pray it won’t. Check out the work of Wim Zwijnenburg and PAX here.